Yellowstone is an amazing Park, but it can get a little crazy in the summer. During the summer months we recommend getting off the beaten path a little to escape the crowds. During the summer driving the park roads during the middle of the day can land you in some serious traffic jams. So we recommend picking some spots and driving to them in the morning and then focusing your time there during the middle of the day when the roads tend to be the busiest. If you can find time the park is a great place to go to in late May and June or from Mid-September into October. You can really beat the crowds and take in all of the animals. We recommend a late May/early June trip while there is still snow in the high mountains. This keeps the bison, elk, deer, and wolves in the lower elevations. Pickup your Wandervans campervan in Boise or Salt Lake. We recommend at least a 5 day campervan rental so you have enough time to see the park. From Boise if you drive out Hwy 20 then you can make a stop at Craters or the Moon to see some amazing lava flows. From Salt Lake you can stop and see the world famous Spiral Jetty on your way north. When going to Yellowstone it is always a good idea to make campground reservation. The first campground you will come to when driving from Boise in Yellowstone is the Madison Campground, this is a great place to stay in your campervan. While in Yellowstone wake up early and walk down to the banks of the Madison River to watch the Buffalo make there morning march up and down the river. Don't forget to stop by the Grand Canyon of Yellowstone and go for a hike down into the bottom to feel the spray. The Lamar Valley is also a great stop for some wildlife viewing. The first thing to think about when camping in Yellowstone is if you want first-come-first-serve or to make a reservation and then you need to understand the length of the campervan you have rented. Our Large campervan is 22ft and we recommend getting a spot for RVs 30ft or less. Our Medium and Small campervans are 19ft so we recommend getting a spot for RVs 20ft or less. There are seven first-come-first-serve sites in the Park and most of them are perfect for camervans and have a toilet and access to water. To check on the status on first-come-first-serve go to the middle of Yellowstone's Campground Page. On the reservation side there are 5 more sites and these are all run by Xanterra, these can be reserved ahead of time by visiting this site. The reservable sites are very similar to the first-come-first-serve as far as features, but some of them do have a couple more features. Canyon and Grant Village Campground have easy access to showers. Camping in Yellowstone is very popular and most campgrounds usually fill up in the park during the busy summer months. Make reservations for the reservation sites as soon as possible since they fill up very fast. Don't despair if you don't get a reservation for a campground instead try your luck at getting a first-come-first-serve site. Plan on getting up early and head towards your chosen campground and plan to arrive before 8:00am, some of the more popular campgrounds can fill up fast. Our suggestion is to just head for the Lewis Lake and Indian Creek campgrounds since they tend to fill up last. These two campgrounds are very nice and we are not sure why they tend to fill up last. It does seem that the sites closest to West Yellowstone tend to fill up first so keep this in mind. Friday and Saturday are the two hardest days to get a first-come-first-serve site. We have listed out the elevation for each of the campgrounds in the park since this is very helpful in deciding which site to pick depending on the time of the year. If you are going in the middle of July and August then a higher elevation site will be cooler at night. While if you are visiting Yellowstone in the Fall or spring it is nice to be in a lower elevation spot since it will be warmer and you have less chance of getting snowed in. Mammoth is the first campground if you are driving in from the north entrance, Mammoth is the only campground open year-round. Since it is a year-around campground it is at the lowest elevation of 6,200ft. This is one of the warmer campgrounds during the middle of summer since you will be camping among sagebrush, and only a few trees for shade. During the spring and fall this is a nice option to stay a little warmer in the evenings. A short trail connects to the Mammoth Hot Springs attractions, and rangers present seasonal programs in an amphitheater. Tower Fall Campground is located on the north side of the steep, winding, road to Dunraven Pass. The campground is near the Tower General Store and Tower Fall, where Tower Creek plunges over 130 feet down to its confluence with the Yellowstone River. 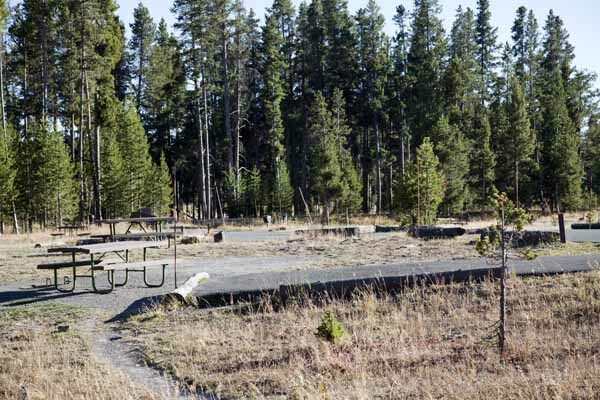 The campground is located in an evergreen forest, Tower Fall campground is small and very quiet campground at the west end of the Lamar Valley, which is famous for wolf sightings. The general store and the overlook to the Tower Fall waterfall are very close. Campground is open memorial weekend through September. This campground is at 6,600ft in elevation. Slough Creek Campground is located in Lamary Valley near some of the best wildlife watching opportunities in the nation park. You will need to drive in on a two mile graded dirt road to access this campground, but it is perfect for campervans. Each site has a picnic table and fire pit with grate. There are some spots located in the trees, and some are in an open meadow, while some of the nicest spots are along the banks of Slough Creek. Since it is such a small campground sites will often fill by 8 am from opening day (usually mid-June) through mid-September. This is a generator-free campground so you are guaranteed quiet, but this also a popular base for anglers and wildlife-watchers. Just remember that many people love this campground since it feels very remote and has a great setting in the Lamar Valley. This campground is at 6,250ft in elevation. Pebble Creek Campground (first-come-first-serve) 27 sites. Pebble Creek Campground is in the Lamar Valley and has Absaroka Mountains as your background. The campground is near the park's Northeast Entrance and is one of the parks most remote campgrounds. Open mid-June through September, Pebble Creek offers a more isolated camping experience. Pebble Creek is a small and remote campground deep in the Lamar Valley and is popular for spotting wildlife and fishing. This campground is at 6,900ft in elevation. Indian Creek Campground (first-come-first-serve) 70 sites. Located south of Mammoth Hot Springs on the road to Norris, Indian Creek Campground is located at the base of the Gallatin mountains with amazing views of Electric Peak. The campground is tucked away from the main park road providing a quieter experience than many other campground locations.This campground sits in an evergreen forest. With mountains, trails, and fishing nearby this remote campground is a great way to experience Yellowstone National Park. This campground is at 7,300ft in elevation. Madison Campground is a large campground located at the confluence of the Firehole and Gibbon Rivers join to form the Madison. Madison Campground is the closest campground to West Yellowstone and is also one of the most popular campgrounds in the park. 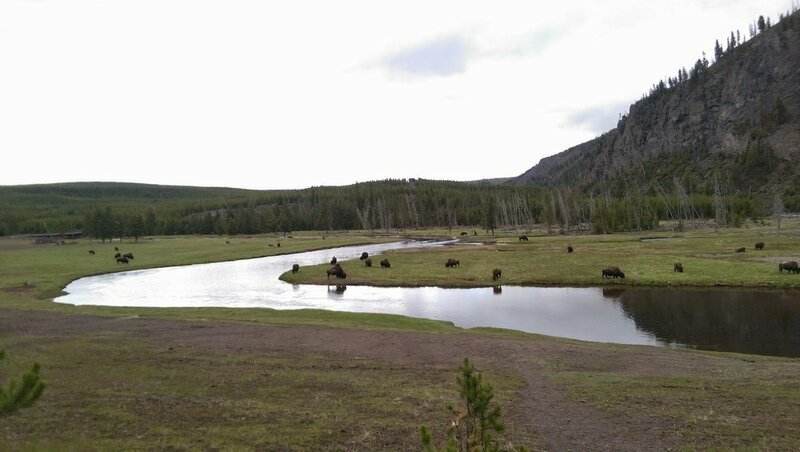 You will find excellent viewing for bison and elk watching. There are also a number of great fly fishing spots. Madison Campground is roughly halfway between Old Faithful and West Yellowstone. There is a ranger station that has a lot of great programs and does a lot of the junior ranger programs for the National Park. If you kids are interested in being junior rangers Madison Campground does provide easy access to the programs. This campground is at 6,800ft in elevation. One of the parks largest campgrounds is the Canyon Campground, which sits in a lodgepole pine forest just a short walk from the restaurants and other facilities at Canyon Village. There are also lots of services available here including laundry, showers, and evening ranger programs. This campground is open from Memorial Day until the end of September. This campground is at an elevation of 7,900ft. This huge campground on the north side of Yellowstone Lake and is basically a large parking lot. This is not the most scenic spot to stay so we would only recommend it as a last resort. There are ranger programs, the Fishing Bridge Museum, Visitor Center, and general store. This campground is open from Memorial Day until the end of September. 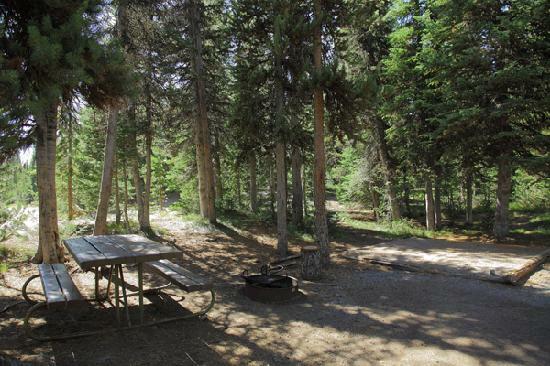 This campground is at an elevation of 7,800ft. Bridge Bay campground is the park's largest campground, but there are some great access points to Yellowstone Lake. You will be very close to the Yellowstone Lake shoreline and then a short walk to the Bridge Bay Marina. You will also find a general store and evening ranger programs. This campground is open from Memorial Day until the end of September.This campground is at 7,800ft in elevation. This is another massive campground in Yellowstone and is located on the shores of Yellowstone Lake’s West Thumb. You will find all of the services here including laundry and showers. You are very close to the restaurants, general stores, and visitor center at Grant Village. There are also a number of evening ranger programs. This campground is open from Memorial Day until the end of September. This campground is at 7,800ft in elevation. Just inside of the South Entrance you will find one of the last first-come-first-serve sites to fill. The sites are all nice and private and remote. Plus you are not far from the shore of Lewis Lake. This campground is probably one of the least appreciate in the park, but can be a great place to score a campervan spot. Lewis Lake is also famous for Moose so keep your eyes peeled for these creatures. This campground is open from Memorial Day until the end of September. This campground is at 7,800ft in elevation. If you are going to be driving into the park late and don't have a reservation then we recomend staying outside of the park and then driving into the park first thing in the morning. The Targee, Gallatin, and Shoshone National Forests run several wonderful primitive campgrounds near the north, northeast, east, and west entrances to the park. Most campgrounds just outside of the park are first-come-first-serve. You will find a wide variety of prices. Near the north entrance you will find Eagle Creek Campground on the Yellowstone River. Getting farther from the park you will find Timber Camp and Bear Creek (both free). There is also Big Sky Resort in Montana and they allow free camping in there parking lot up near the lodge. Outside of Cooke City on the Beartooth Highway you will find Soda Butte and Colter Campgrounds, both of these sites require a campervan or RV. Chief Joseph Campground lies just east of Colter Pass about 4 miles from Cooke City and then further down the road you will find the Fox Creek campground in Wyoming’s Shoshone National Forest. There are two popular campgrounds just past the east entrance and offer riverside camping along the North Fork of the Shoshone River, a campervan is required in since there have been bear attacks. Threemile campground is just 3 miles east from the park entrance and can be reserved ahead of time at recreation.gov. Further east another 5 miles you will reach Eagle Creek campground. Outside of West Yellowstone you will find two State Parks. Harriman State park and Mesa Falls State park both offer camping and some picturesque settings. Baker’s Hole campground is 3 miles northwest of town and is next to the Madison River. Rainbow Point campground is 5 miles from West Yellowstone on Hebgen Lake (reservations accepted; www.recreation.gov). Among private options in the area, Madison Arm Resort stands out for its lakefront campsites, free showers, and a marina with boat rentals (ww.madisonarmresort.com). 1) Grand Canyon South Rim - There is never a better spot to get out of your car than along the South Rim of the Grand Canyon of Yellowstone. There are lots of great view points along the way and the crowds tend to stick to the paved roads in the park. Bring or rent bikes and ride some great trails in the National Park. There are bike rentals at the Old Faithful Lodge if you need a bike for the day. 1) Fountain Paint Pot Loop - Get away from the Yellowstone crowds on this ride. You will get to ride on an old service road that has excellent opportunities to view wildlife and water features. If you want to skip the pavement portion of the loop then simply stick to the service road and do it as an out and back. 2) Lone Star Geyser - The Lone Star trail just beyond the Old Faithful Lodge is a great ride on an old road that will take you to the magnificent Lone Star Geyser. Lone Star Geyser erupts every 3 hours.